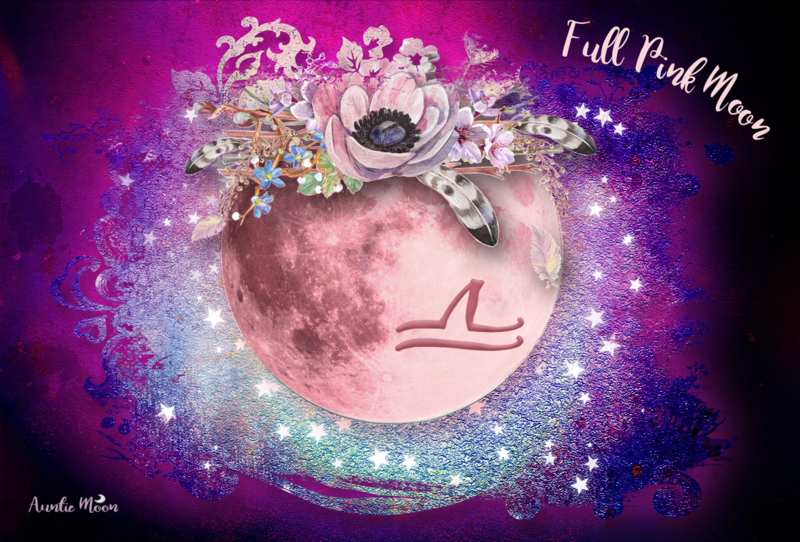 When I first sat down to write this post, I wanted to ask you how you could benefit through the last ten days of this zodiacal year ~ the year that runs from Aries through Pisces. And it IS a good question. But then my mind started drifting. It’s Pisces time, after all. Why focus? I started thinking about all kinds of things from my past, and one of the things that came to mind was how I first entered this odd world of woo-woo and not so woo-woo Wonder. I took up tarot, astrology, and numerology at about the same time, back in 1991. Tarot was my gateway to the others, which followed within a few months. Some of the tarot authors I was reading at the time ~ and I was reading A LOT of them ~ kept mentioning zodiac signs and planets and I said to myself, “Hey! What’s going on here? What does “Taurus” mean, or Jupiter?” I took the first steps toward a long quest to find out. 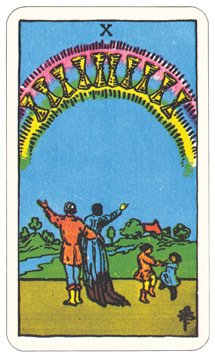 After a while, the three systems became so intertwined in my head that when I look at a card, I don’t see just one card. I see a whole constellation of cards and zodiac signs contained within the one. Let me give you an example. This is what the 10 of Cups looks like to me. When I look at a card, the first thing that happens is that it goes a bit blurry. That blurriness allows the other card images to reveal themselves. They’re blurry, too, or somewhat transparent. Nothing is particularly crisp or sharp. Then associations start to flood in, like tags floating through my head. 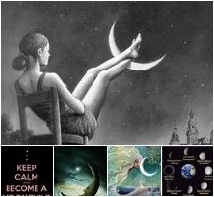 That’s how parts of the cards for Pisces, Neptune, Scorpio, and Pluto find themselves attached to the 10 of Cups. They all come together into a visual montage. 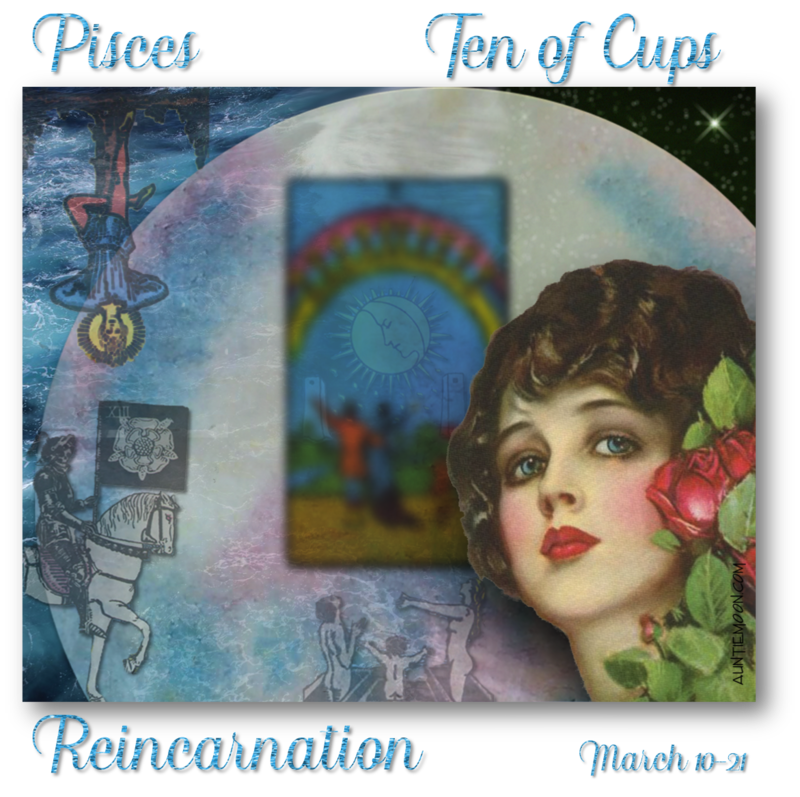 Can you see why I called the 10 of Cups reincarnation? The third (Scorpio) decan of Pisces, through the influence of Pluto (Judgement) is secretive, adept at psychology, and more ambitious than her sister decans. Of all the Pisces decans, she is likely to be the most reclusive. Pluto (Judgement) gives this decan great regenerative ability. It is adept at research, is investigative, and resourceful. This decan, with its keen business sense, is capable of achieving great wealth. As the last of the 36 decans, it is the decan that takes the transformative step into the next life. During these last ten days of the zodiacal year, examine ways in which you’ve stepped into or could step into a new life—marriage, a move, new career, family—and the rewards which are there. (Excerpt from the Tarot-Lunar Calendar for March 2016). Who knew there were so many, right? 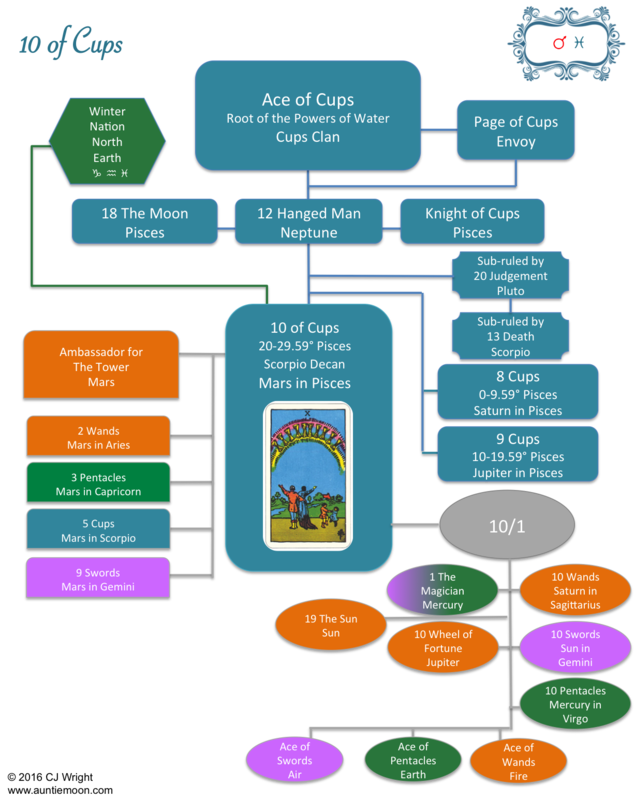 If you’re familiar with all these associations, you might adapt your interpretation if the 10 of Cups is paired with any of these. How would the 10 of Cups paired with the 10 of Pentacles (Mercury in Virgo) fare? I just can’t ~ even with this image of a beautiful rainbow of cups and children happily playing, I just can’t say, “Everything’s wonderful,” and have a credible smile on my face. Which is why I don’t do tarot readings often and why I rarely use more than three cards. I mean, come on. Here’s this beautiful happy 10 of Cups card and I’m talking about endings and death and starting anew, with people popping up out of their graves, a mysterious moon and towers, a hanged man and Death riding a white horse. WTF!?! Sometimes we know too much. There’s too much information and not enough woo-woo. That can happen to me with tarot. (But, oh, how I love the cards.) And believe me when I say that there can also be way too much woo-woo and not enough information. It all depends, right? So, anyway. Here’s to the end of another zodiacal year and my best wishes to you for a fruitful and happy reincarnation into the next cycle.